As a FitFluential Ambassador, I was lucky enough to have an opportunity to receive a sample of ProCakes to review. I'm not always a big pancake eater. However, lately, I have been making more protein pancakes on the weekends, especially after a long run. So, I was very eager to try out ProCakes, even more eager when I realized how easy they were to throw together and how simple the ingredients list is. ProCakes was founded in 2014 by Caren Magill, a fitness enthusiast, bikini competitor and soon-to-be fitness trainer. She left a corporate career in social change marketing to pursue her love of healthy comfort food with zero compromise on taste and enjoyment. 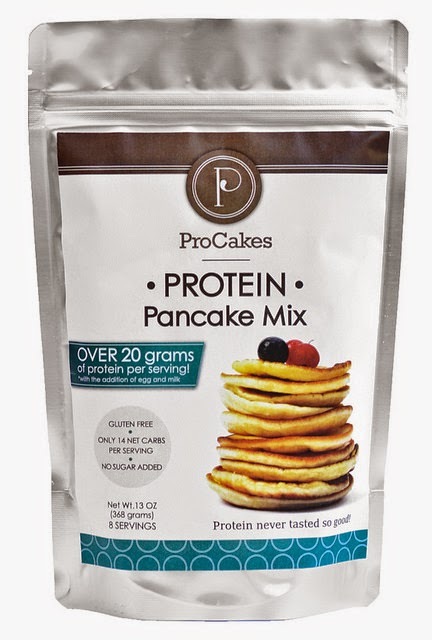 ProCakes is a high protein pancake mix, designed to satisfy cravings for comfort food while providing a healthy dose of protein to help maintain a lean and strong body. It’s one part nutritional supplement, one part awesome baking mix. Made with no with added sugar, and no gluten, we've fused whey protein with a mix of nutrient dense flours like almond and coconut, and paired them with a mix of lighter gluten free flours to keep the overall pancake experience just like you’d expect to taste. Macros (after adding eggs and milk): 20 grams of protein and only 14 grams of net carbs per serving. All you have to do is mix the packet with 1 egg and 1/3 cup milk of choice. I did choose almond milk so the macros above are going to be a little bit different. Some protein pancake recipes I've tried can be really dense. These were light and full of flavor. And did I already mention super easy to make? Yeah, that too. I topped mine with some leftover grilled peaches and some peanut butter drizzle (not shown) and dove in. I not only love the reasons why this company was started, but the pancakes themselves. Healthy ingredients, no added sugars, just clean and simple. Have you tried ProCakes yet? What's your favorite protein pancake recipe. Better yet, what are your favorite toppings?